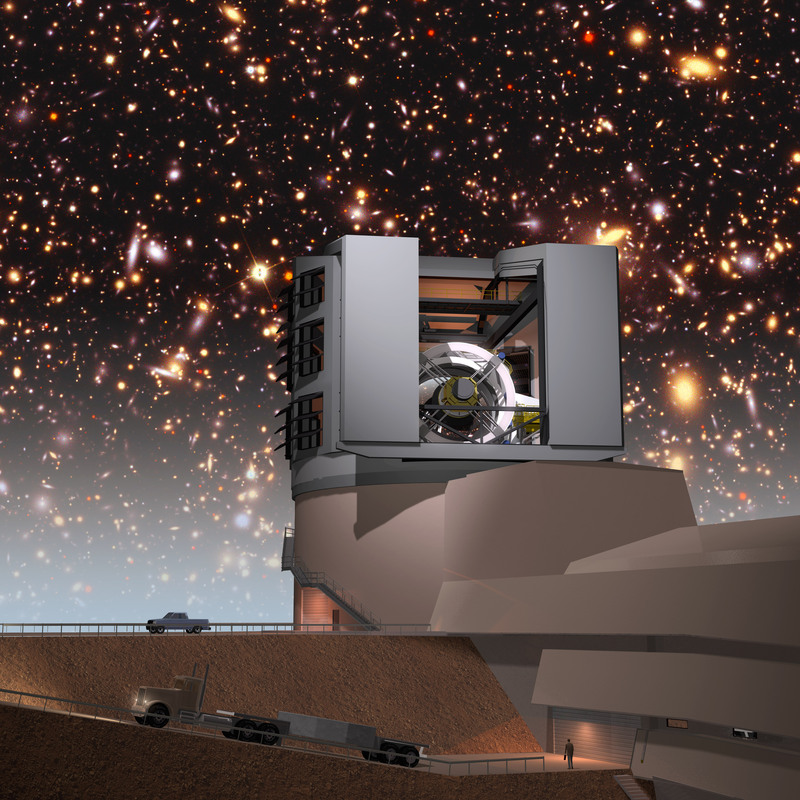 A simulated night sky provides a background for the LSST facilities building on Cerro Pachón in this artist's conception. The scientific questions that the Large Synoptic Survey Telescope (LSST) project will address are profound: What is the mysterious dark energy that is driving the acceleration of the cosmic expansion? What is dark matter, how is it distributed, and how do its properties affect the formation of stars, galaxies, and larger structures? How did the Milky Way form, and how has its present configuration been modified by mergers with smaller bodies over cosmic time? What is the nature of the outer regions of the solar system? Is it possible to make a complete inventory of smaller bodies in the solar system, especially the potentially hazardous asteroids that could someday impact the Earth? Are there new exotic and explosive phenomena in the universe that have not yet been discovered? While the questions are profound, the concept behind the design of the LSST project is remarkably simple: conduct a deep survey over an enormous area of sky; do it with a frequency that results in taking repeat images of every part of the sky every few nights in multiple bands, or segments of the electromagnetic spectrum; and continue in this mode for ten years. The result will be astronomical catalogs thousands of times larger than have ever previously been compiled containing the data necessary to begin searching for answers. It would be impossible to list all the possible projects that LSST data will enable. However, here we list a few to give a flavor of these studies, and organize them by the four science themes that drive the LSST design (although some span more than one theme). LSST will probe the nature of dark matter and dark energy using several billion galaxies, employing a variety of methods to enable cross-checking of results. By mapping galaxies through time and space, cataloguing their masses, and studying their influence on the distortion of space-time, LSST will gain new insight into the nature of dark matter and dark energy. Of particular interest are the dynamical behavior of dark energy—how it behaves with cosmic time or with redshift—and the influence of dark matter on the development of structure on a cosmic scale. LSST’s unprecedented power of discovery will be a giant leap forward in solar system studies. It will measure the properties of several million moving objects (10 to 100 times more objects than are currently available), including orbital, color, and variability information. Among the objects LSST will detect are near-Earth objects (NEOs), with its superior imaging enabling it to find asteroids as small as 140 meters in diameter and as far away as the Main Belt asteroids. Depending on the chosen survey strategy, LSST could detect between 60-90% of all potentially hazardous asteroids (PHAs) larger than 140 meters in diameter. With these much more detailed measurements of the current state of the small bodies in our Solar System, we can gain new insight into how planets form and how our solar system evolved over its history. LSST will revolutionize time domain astrophysics, or the study of how astronomical objects vary in time. By imaging the entire night sky repeatedly, to great depth, and with excellent image quality, it will reveal new information about known kinds of variable stars and cosmic explosions, as well as discover entirely new classes of transient events. Within a minute of each change in the sky, LSST will generate an alert (a notification that a change has taken place), allowing the community to respond and catch events before they fade forever. LSST’s gargantuan and exquisitely accurate collection of data will enable us to answer some fundamental questions regarding our home galaxy, the Milky Way. LSST will survey at least half of the sky and will make hundreds of observations of each surveyed area of sky. A single visit to the entire survey area will map more than 10 times the volume of past surveys. When stitched together in time, this set of observations will yield the motions of millions of Milky Way stars. When stacked in depth, this set of observations will yield a map over 1000 times the volume of past surveys, cataloging the colors and brightnesses of billions of new stars. The LSST Overview Paper has more details. The community has presented posters on LSST science in several events such as the American Astronomical Society's meetings. Visit our Events page for a listing and links to presentation posters.